Larry List is a New York-based artist, model builder, and independent curator who has worked with numerous museums and contemporary artists. He is the guest-curator of the exhibition The Imagery of Chess Revisited (2005) for The Noguchi Museum in New York. Ingrid Schaffner is Senior Curator at the Institute of Contemporary Art, Philadelphia, and is editor of Julien Levy: Portrait of an Art Gallery (MIT Press, 1998). The Imagery of Chess Revisited recovers a celebrated and extraordinary moment in art history: the 1944-45 exhibition The Imagery of Chess, held at the Julien Levy Gallery in New York City. The exhibit was a legend in its own time and has been considered a singular event in the history of art exhibitions ever since. 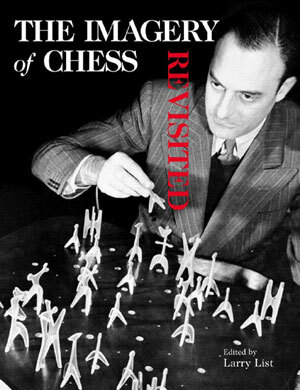 The show's organizers, the influential art dealer Julien Levy, the Surrealist painter Max Ernst, and Dada leader Marcel Duchamp (himself a serious chess player) invited a virtual "who's who" of artists and members of the cultural avant-garde to redesign the standard chess set or otherwise explore chess imagery and its symbolism in bold new ways. Participants included famous European expatriates and soon-to-be famous American modernists: Andre Breton, Duchamp, Alexander Calder, Ernst, Man Ray, Isamu Noguchi, and Yves Tanguy are among those who contributed chess sets; John Cage and Vittorio Rieti created original musical scores; and Dorothea Tanning, Arshile Gorky, David Hare, Man Ray, Matta, Robert Motherwell, and others produced pivotal chess-related paintings, sculptures, and photographic works. Featuring new color photographs as well as rarely seen archival images, recollections by participants and their descendants, and period reviews, The Imagery of Chess Revisited includes previously unpublished works. Among them are Andre Breton and Nicolas Calas's wine-glass chess set and Alexander Calder's chess set made of found materials, in addition to thirty-five of Calder's chess-related drawings. An essay by Larry List explores the chess designs as visual objects and pivotal creations in the context of participating artists' lives and work. Lowell Cross and Paul B. Franklin examine the two musical scores included in the show; and Ingrid Schaffner provides an introduction to the art-world milieu in which The Imagery of Chess took place. 50 illustrations in color, 80 in black and white.